Tropical Foods: Chemistry and Nutrition, Volume 2 contains the proceedings of an International Conference on Tropical Foods: Chemistry and Nutrition, held in Honolulu, Hawaii, on March 28-30, 1979. The papers explore the chemical and nutritional aspects of tropical foods from around the world, including vegetables, coconut foods, wheat, and soybean foods. 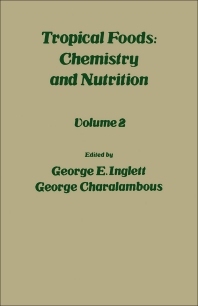 This volume is comprised of 19 chapters and begins with an overview of the nutritional aspects of some tropical plant foods by focusing on nutrition, the nutritional composition of some plant foods, and the applications and limitations of food composition tables, along with assessment of nutritional status and some obstacles to nutritional health. The next chapter surveys tropical foods in the Far East, with emphasis on the processing and nutritional evaluation of fermented foods as well as fermentation and other methods of food preservation. Vegetable production in tropical Asian countries such as the Philippines is also considered. Subsequent chapters look at tropical home gardens as a nutrition intervention, tropical foods in Central America, and some aspects of traditional African foods. This book should be a valuable resource for biochemists, nutritionists, and nutritional scientists.